While band may seem like just a bunch of crazy geeks who spend way too much time together, it’s so much more than that. It’s a home to kids who would otherwise be eating lunch at a table alone. It’s a place where students can be themselves and express their creativity in a way no other activity offers. It’s a place where memories and friendships that will last a lifetime are made. The West Jessamine High School stop motion action film club Moving Pictures entered and won the high school division of the High Bridge Film Festival for their short film Feast Friends. Feast Friends centers around a man, alone on Thanksgiving, who realizes the true meaning of Thanksgiving. The members of Moving Pictures wrote, shot and edited the whole film by themselves. Sophomore Kaitlyn Kearns did the storyboarding, some members acted in the film and others helped move the props to make the over 2,000 photos appear seamless. 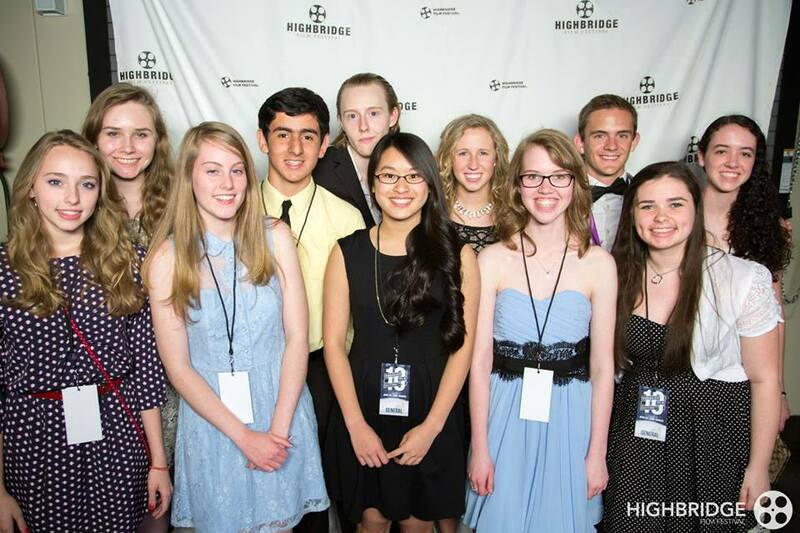 Moving Pictures hopes to enter the 2015 High Bridge Film Festival next spring. On May 29, the West Jessamine band, choir and visual arts programs will come together for a spectacular performance. As the visual arts department is creating pictures and paintings to display during the event, the band and choir are preparing to perform. This will be the first time that these programs team up. Come and support your arts programs! On April 15, the Jessamine County Family, Career and Community Leaders of America (FCCLA) organization held its first annual Spring Fling at JCTC to raise organization funds. The officers and volunteers created six fun stations including pictures with the Easter bunny, face painting, crafts and other exciting games for children to enjoy. Members baked cupcakes for Easter decorating and even printed out Easter bunny pictures for families to take home. At five dollars a ticket, the Jessamine County FCCLA raised $320 with 85 kids in attendance. This contributed greatly to the club’s treasury and will able them to help fund future community service projects. Overall, the FCCLA Spring Fling was a huge success and will become an annual event the club will continue to organize. On Monday, March 10, West Jessamine sophomore Judianne Speach was awarded Regional President of the Family, Career and Community Leaders of America (FCCLA) of Kentucky. FCCLA is a national club that encourages family, careers and being community leaders, all of which Speach is known for. She was given this honor after a grueling series of interviews, applications and presentations. As regional president, Speach is in charge of overseeing meeting, organizing projects, and training new members. Congratulations to Judianne on the great achievement. Keep representing West Jessamine. 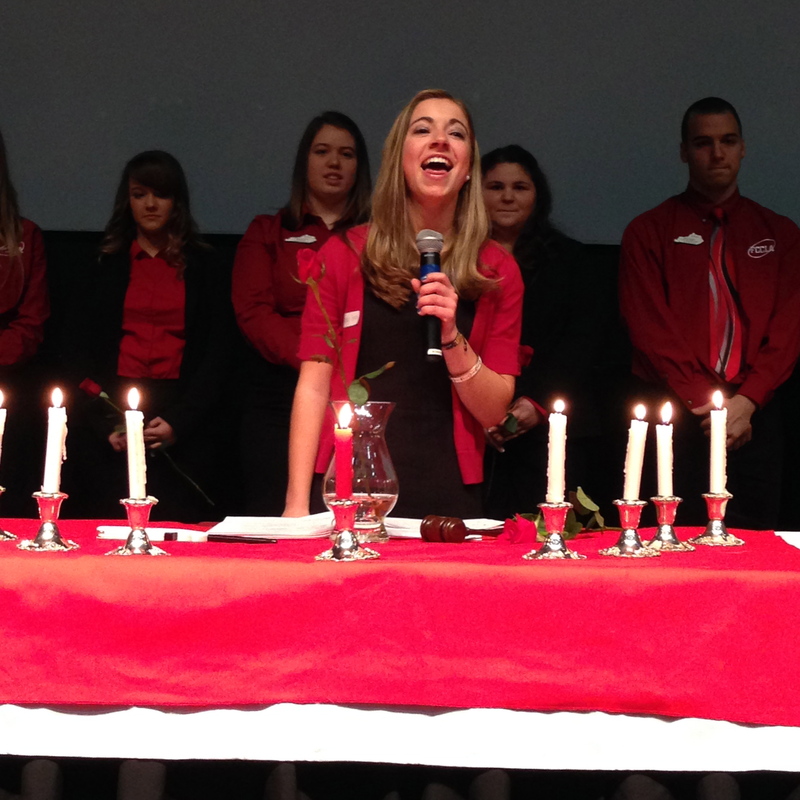 West sophomore Judianne Speach led the FCCLA closing ceremonies after being installed as Regional President on March 10. The Kentucky United Nations Assembly (KUNA) is a student-governed conference where students represent various countries in the United Nations as ambassadors, debating issues varying from poverty and world hunger to nuclear arms and environmental concerns. Members come from across Kentucky to participate in the conference, the largest youth government conference in the United States. 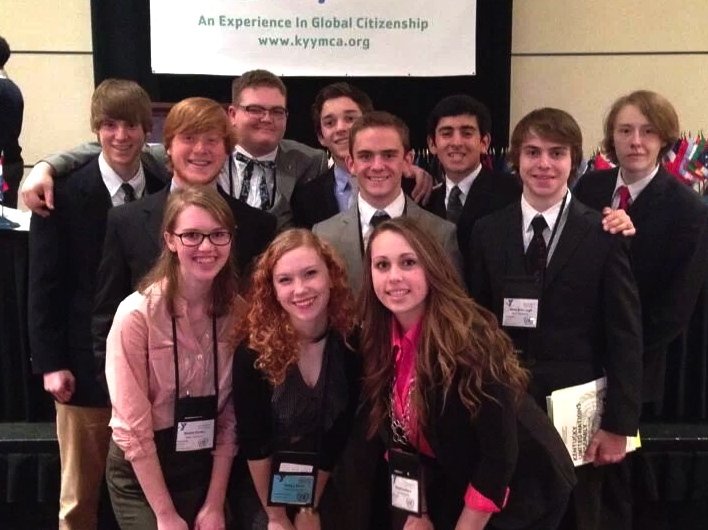 The West Jessamine Y-Club represented South Africa in the Kentucky United Nations Assembly in Louisville from March 13-16. Members Jesse Seales, Jonathan Miller, Cale Canter and Sean Seagraves drafted a proposal that would extend the United Nations policy on sexual harassment and abuse in the workplace to public schools across the globe. The proposal was ratified almost unanimously by the ambassadors of KUNA. Members Abbey Bowe and Jesse Bronaugh represented Russia and South Africa, respectively, in the KUNA Security Council discussing global issues such as Water Usage and the Crimean Conflict, and passed a proposal to give South Africa and other nations absolute veto power over the Security Council. Members Nicole Fielder, Joe Bandy and Fabian Leon participated as ambassadors representing South Africa, debating issues like Sugar Cane Fuel Research and Water Purification. Monica Alden and Gentry Fitch acted as Parliamentarians, keeping time, records and chamber doors. Cody Emberton was a Media Corps videographer, documenting debates and General Assemblies. Awards were given to the proposal authors for the ratification of their proposal on sexual harassment. Cody Emberton was named next year’s Media Corps editor for outstanding camera work, and the club as a whole won outstanding delegation for participating in all events and showing remarkable leadership. If you are a junior, sophomore or freshman passionate about issues affecting our world and want opportunities as a leader in your community, contact President Abbey Bowe (abbey.m.bowe@gmail.com) or Mr. Cabrera (James.Cabrera@jessamine.kyschools.us). Meetings are held Fridays after school in Mr. Cabrera’s room. The West Jessamine Academic Team recently competed in the region 11 competition. The quick-recall team beat Scott County 45-17 and then Western Hills 33-13 in their first two rounds of competition. They then went on to defeat Woodford County 36-15, but ultimately lost to Dunbar in the finals. Nevertheless, the team finished in the top two in the region and was able to punch their ticket to the state competition. 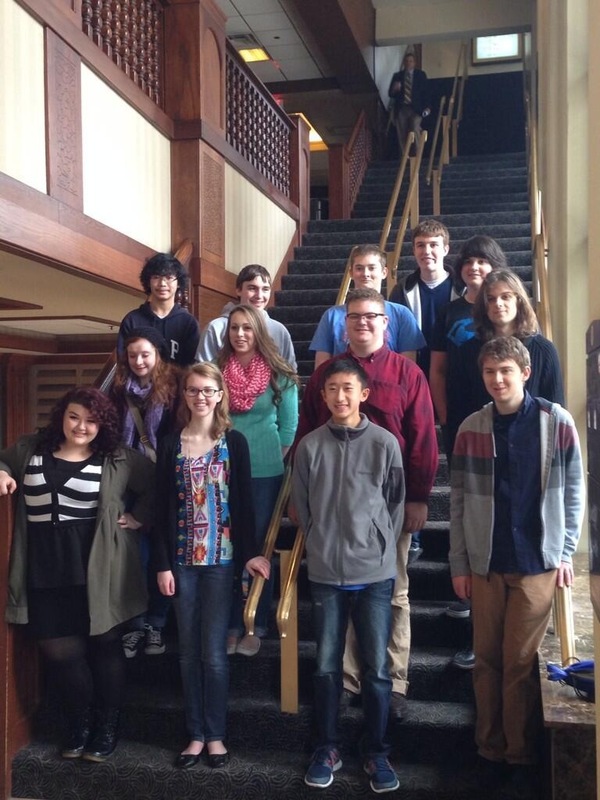 West also had six individuals move onto state for their written assessments. At state, the quick recall team lost the first round, won the second and lost the third. Although faced with a loss at state, the academic team deserves congratulations, as it is a huge accomplishment to even make it to state. Congratulations to team members Monica Alden, Cale Canter Jerod Crockett, Jed Chew, Jonah Dixon, Noah Dixon, Abbi Donelson, Nicole Fielder, Clay Fugate, David Fugate, Stephen Goodlett, Young Koh, David Lee, Shawn Murphy, Joseph Oaks and Amanda Settles. 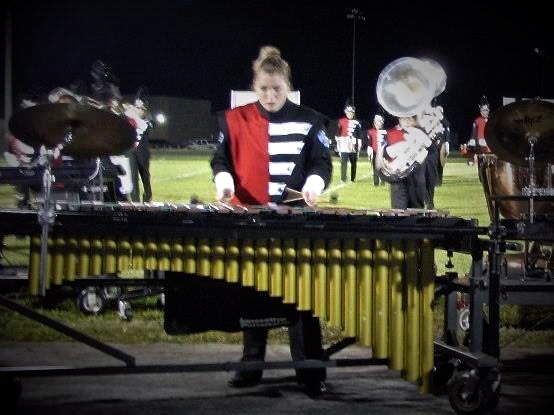 We all have hobbies and interests, and for sophomore Emmaline Adams, her fervor is music—percussion, more specifically. She has played percussion since sixth grade, so when her music instructor suggested auditioning for a music summer camp at Interlochen Arts Academy, she thought, why not? The music Arts Academy is for grades 3-12, and only 2500 people in the entire country attend the seven-week camp. Singer Josh Groban attended as a child, if that gives you a better idea of the program’s caliber. After months of practicing and perfecting her audition tapes, Emmaline was more than relieved when she found out that she was accepted—in fact, she recalls squealing after receiving the news as she transitioned from her first block class. Of course, West Jessamine is proud to be represented for the very first time at such a prestigious camp. It’s also very expensive, so if you want to lend a helping hand, go to http://www.gofundme.com/interlochen2014 to donate. Sophomore Emmaline Adams has been accepted to the Interlochen Arts Academy after dedicating five years to music. After the putting on Sweeney Todd: The Demon Barber of Fleet Street in the fall and, more recently, Cinderella, the West Jessamine drama department is beginning to prepare for a spring show, which will be a combination of Krista Boehnert’s Puzzle Pieces and Bradey Hayward’s Sixteen in 10 Minutes or Less. Director Hallie Brinkerhoff expects the show, a loosely structured, highly interpretive production dealing with the theme of teenage issues, to be an “unusual theatrical experience.” Puzzle Pieces, the first half of the show, is a set of monologues where the characters speak openly on issues like their fears, angers, futures and daily struggles. The second half of the show, Sixteen in 10 Minutes or Less, consists of ten vignettes, or short independent scenes that each recount a single episode or event. These also offer views on the universally experienced but rarely publicly discussed feelings of teenagers struggling to find their place in the world. Despite not being a completely new student-written show as was a potential idea earlier in the year, the scripts will be altered or added to so they better suit the personalities and talents of the actors. It is likely that some of the monologues performed in Puzzle Pieces will be written by West students, and musical aspects may also be incorporated into the production in order to showcase the talents of the many student musicians involved in the drama department. The show is intended to be performed in late April, with a tentative student performance during school on April 23 and evening performances April 24-26. There is a possibility of show dates being moved into May for logistical reasons, but any changes will be publicized as soon as possible. The West Jessamine drama department appreciates your support!